Central power began to decline under successors of Ramses III, while the power of High Priests of Amon arose in such extent that high priest Herihor founded a dynasty of priest-kings who ruled southern Egypt during the last years of the 20th dynasty. Egypt under weak pharaohs of the 21st dynasty was de factodivided into southern Egyptian temple state and northeastern Nile Delta which was indirectly ruled by pharaohs although southern Egypt formally recognized the state’s unity. Eventually Libyan mercenaries interfered the struggle for the Egyptian throne and one of them - Shoshenq I assumed power in 945 BC and was also recognized by the southern “temple state”. Egypt was ruled by pharaohs of Libyan origin until 716 BC (22nd to 24th dynasties) when Egyptian throne was seized by the Nubians who founded Kush on the territory of Egyptian province Nubia in the 10th century BC. Kushite rule (25th dynasty) in Egypt lasted until the Assyrian conquest of Egypt in 671 BC. Assyrian power began to decline shortly after the conquest of Egypt and client king and founder of the 26th dynasty Psamtik I managed to reunite Egypt under his rule, drove out the Assyrians and achieved his recognition by the Kushite kings. 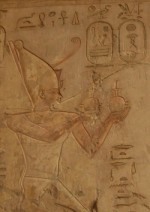 Accession of Psamtik I to the Egyptian throne in 663 BC is traditionally viewed as the beginning of the so-called Late Period which lasted until 323 BC. Egypt under pharaohs of the 26th dynasty or Saite Dynasty (as often referred after the capital city Sais) entered a period of prosperity although a short one. Persian king Cambyses conquered Egypt in 525 BC and transformed it into a Persian province ruled by satraps or governors (27th dynasty). Native Egyptian rulers (28th to 30th dynasties) managed to expel the Persians in 404 BC and to renewed Egypt’s independence. Artaxerxes III of Persia recaptured the Nile Valley in 343 BC but the second Persian overrule in Egypt lasted only one decade. Persians were defeated and expelled by Alexander the Great in 332 BC, while Egypt became a part of the Empire of Alexander the Great.